"We are locals in the valley ourselves and we have enjoyed working with you folks for maybe 5 years now. Great service." Beautiful townhome at the edge of Bozeman with walking trails right out the back door. Great location between Bozeman and Bridger Bowl Ski Area. This home has air conditioning and a one car garage. 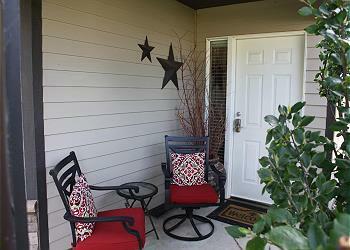 BRIEF DESCRIPTION: This small comfortably appointed townhome is perfect for a group of 4 guests. It’s close enough to our historic downtown to bike or drive easily, but it sits right at the edge of town, with walking trails and great mountain views right there. Walk to Story Mill park just a couple of blocks from the home. This is an amazing location! 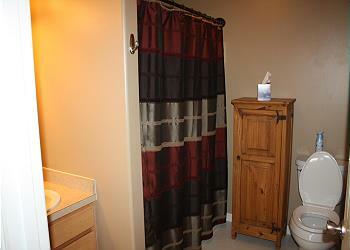 BEDROOMS AND BATHS: The home has two bedrooms and two baths. The master bedroom has a king size bed and a full private bathroom. It has a large closet and a tub/shower combo. The second bedroom has two twin size beds. 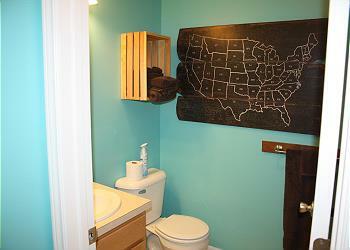 The second bathroom is located off the hallway and has a shower. KITCHEN: The beautiful kitchen is stocked with everything you will need to prepare your meals. 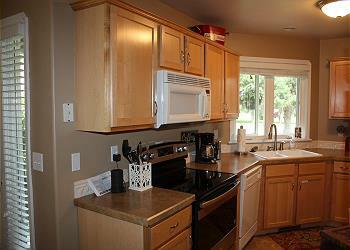 It has plenty of counter top space and nice appliances. There is also a gas grill on the porch. DINING AREA: There’s a dining table that will seat four comfortably. LIVING ROOM: The living room is open to the dining room with a beautiful gas-fired rock fireplace and a large flat screen TV with cable service. There is a cozy couch and leather chair plus two chairs situated to enjoy the ambiance of the fireplace. SETTING, ACREAGE, VIEWS: This house is located at the edge of Bozeman within blocks of Story Mill Park scheduled to open in late 2018. One of our favorite coffee shops, Ghost Town coffee, is a short walk away. There is a great trail system right out the back door linking the home to downtown, the mountains and beyond. In winter you can walk to trails for cross country skiing. CLOSEST TOWN AND AIRPORT: You are two miles from Bozeman’s Main Street and a 15- minute drive from Bozeman’s Gallatin Field Airport. ACTIVITIES NEARBY: Besides hiking, biking and skiing on “your” trails, you are just across the road from Bridger Creek Golf Course, the best public course in Bozeman, you’re just 14 miles from Bridger Bowl Ski Area and a few more from Bohart Ranch Cross Country Sky area. The Bridger Ski Foundation maintains Nordic trails in five areas around Bozeman including Bridger Creek Golf Course just next door. There is fishing on the nearby East Gallatin and main Gallatin Rivers, horseback riding, rafting, and everything that the fun town of Bozeman has to offer. Yellowstone National Park is only an hour and a half away.